"I got this recipe from a friend, it is a very popular Turkish/Middle Eastern salad." Place the bulgur in a bowl; stir in the boiling water. Cover and let stand for 20 minutes. Meanwhile, heat 2 tablespoons olive oil in a skillet over medium heat. Stir in the chopped onion; cook and stir until the onion has softened and turned translucent, about 5 minutes. Drain the bulgur and return it to the bowl. Add the cooked onion, chopped tomatoes, cucumber, green and red bell peppers, green onions, parsley, mint, and red pepper flakes. Drizzle with 2 tablespoons olive oil, the lemon juice, and the pomegranate molasses. Toss gently until the salad is thoroughly combined. Serve immediately, or refrigerate until serving. You may substitute balsamic vinegar for the pomegranate molasses. As is it is good but usually you add red pepper paste(biber salcasi)to this if you can find it. It is an excellent flavor that makes this even more delish. Thank you! The pomegranate molasses really made it special. 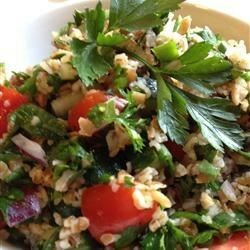 A great recipe for Bulgur (aka Tabbouleh) Salad. We enjoyed the addition of the pomegranate molasses. I left out the green bell pepper as I did not have any on hand. Great summer salad. I added Kosher salt to taste. This has become one of my favorites very light and refreshing and the family loves it. You don't want to heat the olive oil and cook the onions. I used succulent red onions. Also, if you can find sumac, add a tablespoon of it. I made it yesterday. It's nice but it needs salt and more olive oil.